Away from the crowds is usually how we like to fish and this day the was no different. With the crowds bigger than ever, I'm talking a small towns worth of people out on this lake,we wanted to be at least 100 feet away if not more from the nearest anglers. We got on the ice later than usual and drove as far as we could safely, loaded up the sled and walked another few hundred feet. Sun shining, augers howling, we got to work drilling holes and setting up a home base. 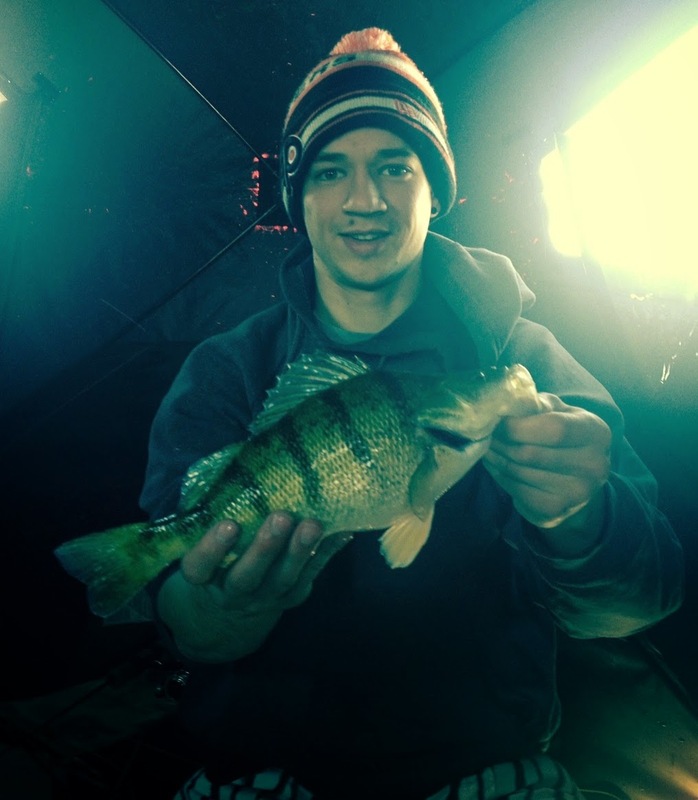 After spending as much time scooping ice chips and slush out of the holes as we did drilling them, we got to fishing. We each dropped a lure down and were instantly bringing up our first fish of the day, followed by another and another and another. Feisty, hungry perch. If this was a sign of how the day was to go, we were not about to complain. First lure of the day was my PK flutter spoon in glow fire tiger, and it was on fire! There were some very aggressive fish swimming through that just could not resist it. The first ten or so hit it without thinking twice, but the next few schools were more tentative. I decided to tip my spoon with a minnow tail or head, I like to call this my confidence and the fish began to hit it again. The action was so swift that a second line was more of a detriment than an advantage. The fish would hit a dead stick but jigging and lifts seemed more productive and resetting two lines was wasting time when the schools were below. It seems around the middle of march every year we see the first few canada geese coming back, this year was no different, despite the harsh winter. Outside of the shelter a beautiful bald eagle was spotted soaring around and scavenging fish remains on the ice. The action continued steadily all day only slowing down when a pike would cruise through our area, fifty percent of the time attacking at least one of our lures. Tom coincidentally lost five of his most productive lures. 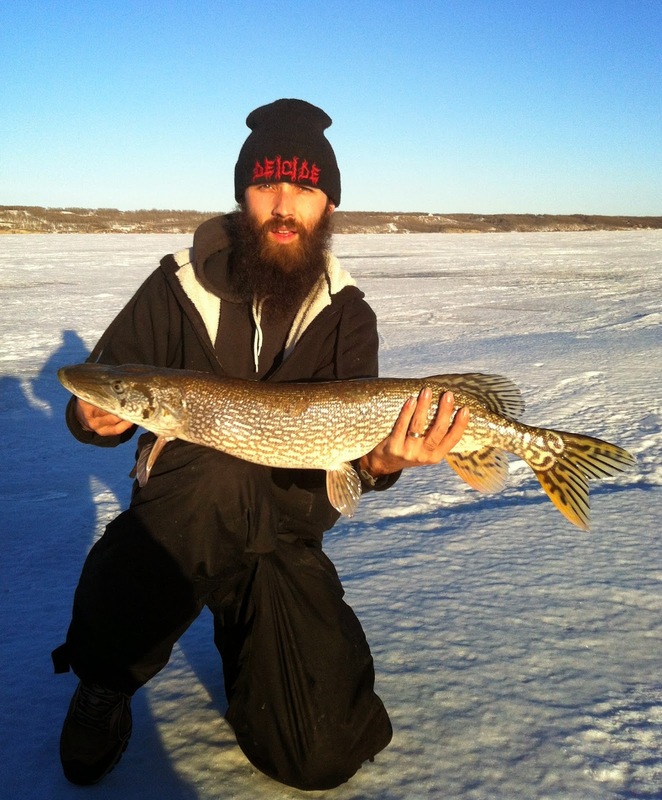 I had hooked into a really nice pike that spooled out most of my line, the fight was phenomenal and the weight felt heavier than the 37.5 incher I landed last ice season on the Red River. After regaining most of the line multiple times we got a glimpse of its body gliding along the bottom of the ice, it was hard to judge it's size looking down through almost four feet of ice. Even after three or four good runs it still had a lot of energy and some how the hook popped out. A really fun fight but I was disappointed I wasn't able to land the fish. 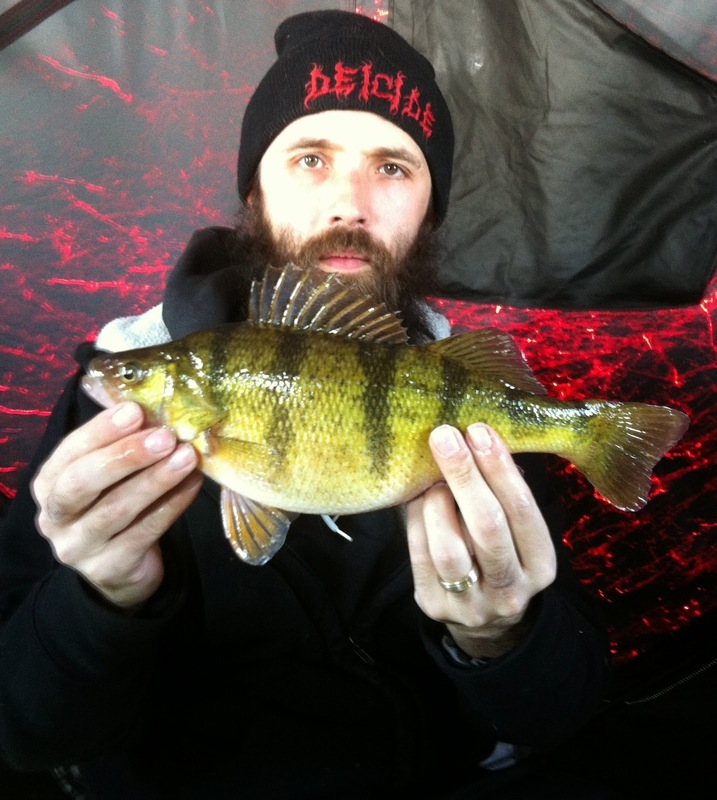 Perch after perch landed, the average size was 11 inches, with very few small ones caught. Our biggest of the day was 12 7/8 inches. The pike would routinely come through and you would gamble a lure to get their attention or get it out of the water fast. I was able to hook into a few more with the biggest landed being 33 inches, some quick pics and off it went to fight another day. Frodo had the juvenile walleyes dialed in landing eleven of the little guys ( he was hoping for one nice keeper) and Tom one, all released to grow some more. The rest of the day was filled with laughs and stories, with an abundance of fish retained and released as well as Tom losing 5 lures to pike bite offs. The sounds of augers drilling in the distance was steady until around supper time. 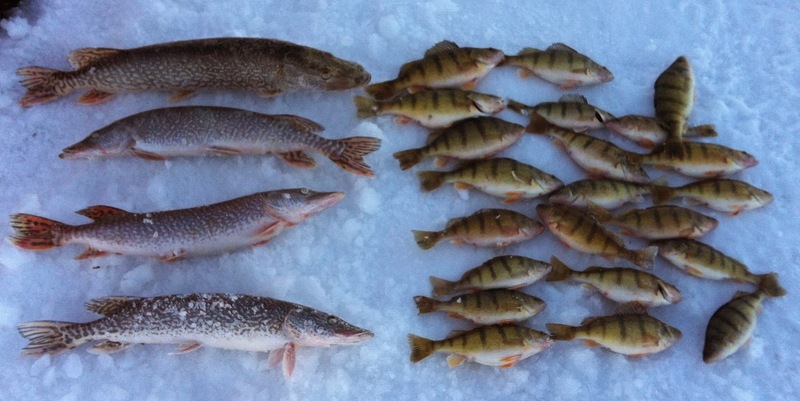 After probably the best day on the ice for non stop action, I came home to a lot of work cleaning fish. 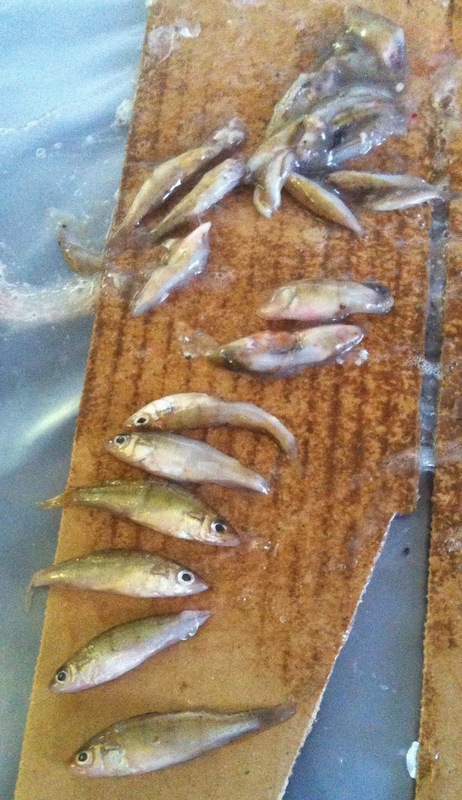 A family meal was had frying the perch fillets and eating some pike jerky that i will post about soon. The title "Perch ... It's What's for Dinner" comes from the pictures below. 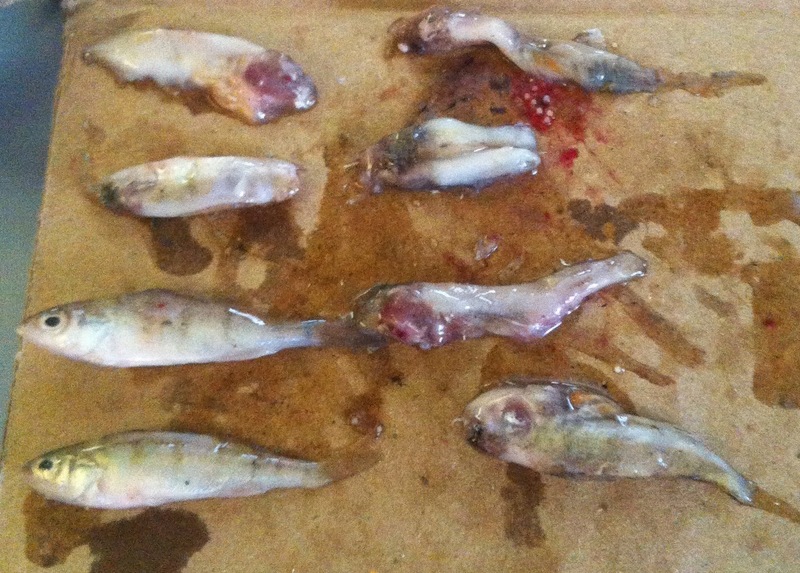 Left was the stomach contents of a twelve inch perch and right the contents of a 25 inch northern pike.